The Fernando Alonso era at Ferrari is over. It did not yield a world title as it was supposed to but it helped Alonso re-build a damaged reputation from his 2007 season at McLaren. Though he arrived and departs as the same double world champion in name, he has underlined his status as the most complete driver on the grid. ESPN charts the ten best drives from a period of time which will be remembered as much for what it could have been than it actually was. Alonso matched the achievement of Kimi Raikkonen by winning on his Ferrari debut. He had spent the early stages of the race behind Sebastian Vettel but started reeling in the Red Bull after the first round of pit stops. He had whittled the gap down to just over a second before Vettel's engine blew, denying fans the chance to see a thrilling battle for the lead. Though fortunate Vettel's race was cut short, it was a formidable performance from Alonso as he finished some 14 seconds clear of team-mate Felipe Massa. It was his first win since Japan 2008 and confirmation of his status as pre-season title favourite. 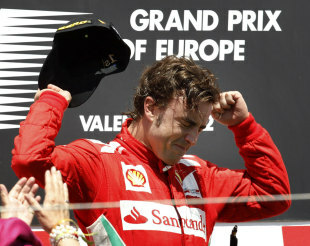 High point: He missed out on the title by three points but 2012 underlined Alonso's talent in an inferior car. Low point: The decision to cover off Mark Webber's pit stop in Abu Dhabi in 2010, leaving him stuck behind Vitaly Petrov for the rest of the race and allowing Sebastian Vettel to steal the title. Alonso, who had become the pantomime villain of the 2010 season after the team orders controversy in Germany, put himself well and truly back in the title fight in front of a jubilant Tifosi. Alonso claimed pole but was jumped off the line by Jenson Button, before championship leader Lewis Hamilton retired on the first lap. Alonso waited patiently behind Button until the final pit stop and successfully undercut the McLaren as Ferrari nailed its strategy. It was the first Ferrari victory at Monza since Michael Schumacher in 2006 and there was better to come. After victory in Monza, Alonso went to Singapore back in the hunt and took an unexpected pole after topping a memorable Q3 session under the lights. Alonso led into the first corner and had Vettel for company for the rest of the race. The Spaniard was undaunted and remained completely calm under pressure, leading every lap and holding off the faster Red Bull behind him from start to finish. Alonso was just three tenths ahead of Vettel when the chequered flag fell. More remarkable was the fact it was the first, and so far only, Grand Chelem (pole position, fastest lap and victory) of Alonso's storied career. Having looked dead and buried earlier in the season, Alonso took the championship lead with his third win in four races. A huge rainstorm meant 17 laps were spent behind the safety car. At the restart, championship leader Mark Webber spun into a wall and out of the race. Alonso was second and fighting Vettel and Hamilton for the lead, but a wheel-nut problem cost him time in the pits. He soon re-passed Hamilton and set about closing in on Vettel but, just like Bahrain at the start of the season, the Red Bull's engine denied a thrilling fight for the lead as Alonso closed up on its gearbox. Vettel's retirement should not take away from his drive and the fact this was one of the more dramatic and memorable moments of the Alonso era at Ferrari. "This one is the most beautiful, the most, most beautiful," race engineer Andrea Stella told Alonso as he took his first win of 2012. Beautiful is debatable; remarkable is not. Coming into Malaysia, Ferrari was reeling from a horrible pre-season and an Australian Grand Prix which saw Alonso finish fifth. Qualifying eighth, his chances of victory in Sepang looked slim in the dry but an early rainstorm and stoppage changed everything. Alonso jumped the McLarens at the pit stops, then passed Sergio Perez and started to build a lead. 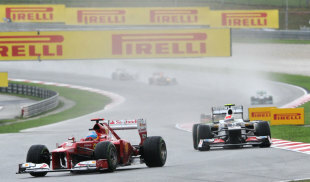 As the track dried out he held his nerve as Perez closed in before a mistake from the Mexican sealed Alonso's victory. 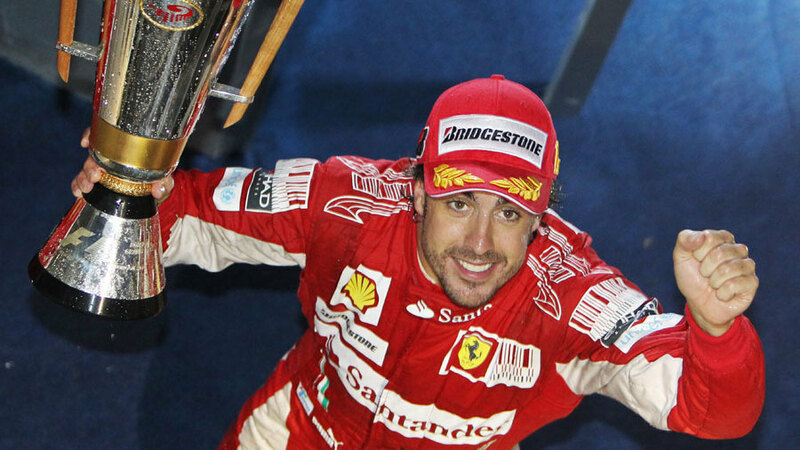 It was the catalyst for Alonso's most remarkable season at Maranello. Alonso shed tears on the Valencia podium after what could be described his best drive not just at Ferrari but in his entire F1 career. Starting 11th his prospects of a podium, let alone victory, looked bleak. But it is in those situations that Alonso's real talent comes to the surface and by the end of the first lap he had battled his way up to eighth on the tight street circuit. He then passed Nico Hulkenberg before two blistering laps saw him dispatch Pastor Maldonado in the DRS zone and Michael Schumacher with a classy move from the exit of Turn 3 down to Turn 4. A safety car period followed and Alonso jumped Hamilton at the subsequent pit stops, before a supreme pass on Romain Grosjean around the outside of Turn 1 at the restart for second. 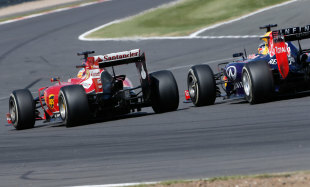 Vettel's engine then failed, handing the lead to Alonso and it was one the Ferrari driver never relinquished. It was a world class drive from Alonso on a circuit not renowned for its overtaking opportunities and one which delighted the home crowd. 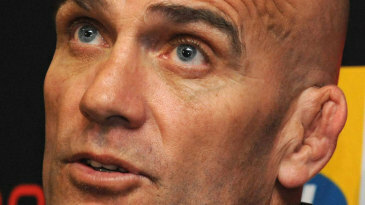 After the race, he said the race win was extra special to him with Spain reeling from the global recession. It was his first win at home since 2006. Alonso's final victory for Ferrari and one of his best. His aggressive start was key; starting fifth, he passed Kimi Raikkonen at the first corner and then rounded old adversary Hamilton around the outside of Turn 3. After leapfrogging Vettel at his first pit stop he then eased past Nico Rosberg into the lead on lap 13. Once in front Alonso pulled away and set about on an ambitious four-stop strategy. It soon became a race for victory with Raikkonen and, though he emerged behind the Lotus after the pair's final stops, he dispatched the Finn quickly with the benefit of fresher tyres. It was his first Barcelona win for seven seasons but would be the high point of an otherwise frustrating season as the best of the rest behind Vettel. 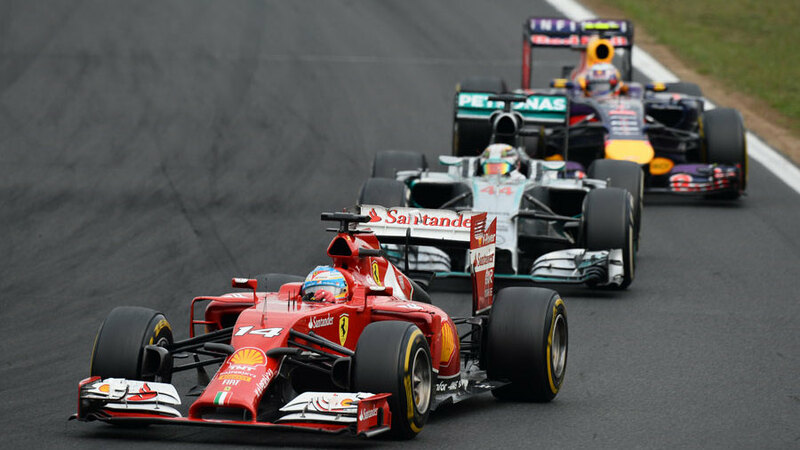 This drive typified Alonso's efforts in the latter half of the season as Vettel recorded nine wins on the spin. Another aggressive first lap - where he passed Mark Webber into Eau Rouge - moved him up to fifth position from ninth on the grid. After that he dispatched Jenson Button and Nico Rosberg in successive laps, before capitalising on a Lewis Hamilton error on lap 14 on the run down to Eau Rouge to move into second. He then held firm through Les Combes despite Hamilton having DRS. Vettel was untouchable out in front and Ferrari had fallen off the pace since his win in Spain, so victory was a bridge too far in Spa, but it was another hugely impressive 'best of the rest' performance. Don't be put off by his final position, this was Alonso at his best in the underwhelming Ferrari F14 T. The highlight was Alonso's breathtaking duel with Sebastian Vettel. Their wheel-to-wheel battle was, for a few laps at least, similar to Rene Arnoux and Gilles Villeneuve in 1979, with both men refusing to give the other an inch. The highlight for Alonso was a ballsy lunge around the outside at Copse which sparked a Vettel tirade on the radio. Vettel eventually prevailed in the Battle of the Track Limits but the fact there was a fight at all was proof Alonso was driving the life out of his red car. Had this race been two laps shorter it may well have been the greatest win of his career. Pre-race thunderstorms created uncertain conditions at the start, before a downpour in the opening stint changed everything. The rain propelled Alonso into podium contention and, when the track dried out, he pitted on lap 38 of 70 for soft tyres, fully intending to pit again. When it became clear victory was up for grabs Alonso stayed out. The 2014 Ferrari had no right dicing with either Mercedes or Red Bull but as the laps ticked away Lewis Hamilton, on medium tyres just one lap younger, struggled to get by. In the end, Daniel Ricciardo's three-stop strategy and superb overtaking skills saw him dispatch both men but Alonso's second position would be the crowning moment of his 2014 season.